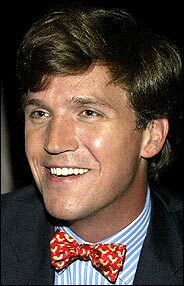 Who’s your daddy now, Tucker? “CNN has ended its relationship with the conservative commentator Tucker Carlson and will shortly cancel its long-running daily political discussion program, ‘Crossfire,’ the new president of CNN, Jonathan Klein, said last night. …Mr. Klein said he wanted to move CNN away from what he called ‘head-butting debate shows,’ which have become the staple of much of all-news television in the prime-time hours, especially at the top-rated Fox News Channel. "Not One Damn Dime Day"